For a climate as unpredictable as Melbourne’s, it makes sense to install a well-functioning irrigation system. At Everlast Services, we have a history of experience installing multiple types of water irrigation systems. 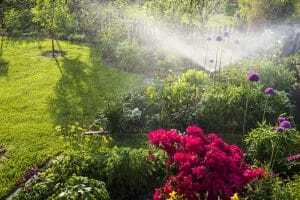 When it comes to garden irrigation and drainage solutions, we specialise in drip systems and sprinkler systems. As a full-service landscape and materials company, we also manufacture our own supplies. For certain types of environment, sprinkler systems of different kinds achieve fantastic results. Providing you have a correctly installed rain sensor, sprinkler systems can provide the all-important sustenance your land requires over vast areas. Everlast Services proudly provides top-quality workmanship, irrigation supplies and systems to the Victorian public. Australian owned, Everlast is able to offer truly outstanding prices thanks to a few key factors. First, our efficiency, project management, and service excellence is second to none. But importantly, we manufacture many of our own materials at our first-class manufacturing plant in Hoppers Crossing, Melbourne. So when you choose Everlast Services, you’re also supporting local Australian contractors and manufacturers. We have a clear mission here at Everlast: to offer outstanding services and irrigation supplies at an affordable price. And this isn’t just talk. So how can we manage this in today’s market? The answer is simple. We’re proud to say that our 20 years’ worth of experience in landscape design and materials manufacturing mean that we understand this business inside and out. But moreover, we have the capacity to manufacture our own materials. In this way we cut out the middle man, and save you money. For all of your irrigation, drainage and landscaping needs, contact Everlast Services today.